How do we measure the distance to astronomical objects? Which units of measure do we use? Historically, the first way to measure the distance to the stars is by trigonometric parallax. The angular position of one object observed from two observation points distant enough from each other provides the distance to the object by simple trigonometry. Because of the parallax, one relatively nearby star appears shifted by a certain angle with respect to stars which are more distant. The more distant an object is, the less affected its angular position is when observed from two different points. The relation between distance and angle is inverse because the further away is something, the smaller the angle. If we measure the position of a star within an interval of 6 months, B = 1 AU (Astronomical Unit == the average distance between the Earth and the Sun == 149,597,870,700 metres ~= 150 million km). For practical reasons, the parsec (pc) was defined. 1 pc = distance from which the radius of Earth’s orbit subtends an angle of 1”. There are no other stars in a sphere of radius 1 pc around the Sun. 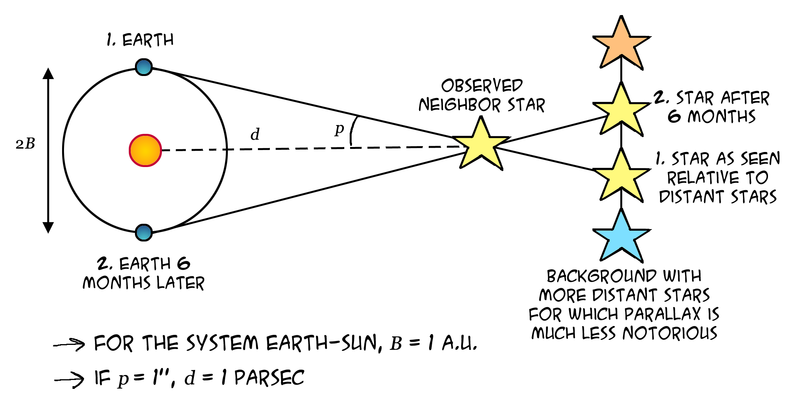 Therefore, even the closest star (Proxima Centauri) has a parallax of less than 1” (it is 0.77”). Maximum accuracy: Using spacecrafts above Earth’s atmosphere, parallax angles approaching 0.001” have been measured (1/0.001” pc == 1000 pc == 1 kpc). 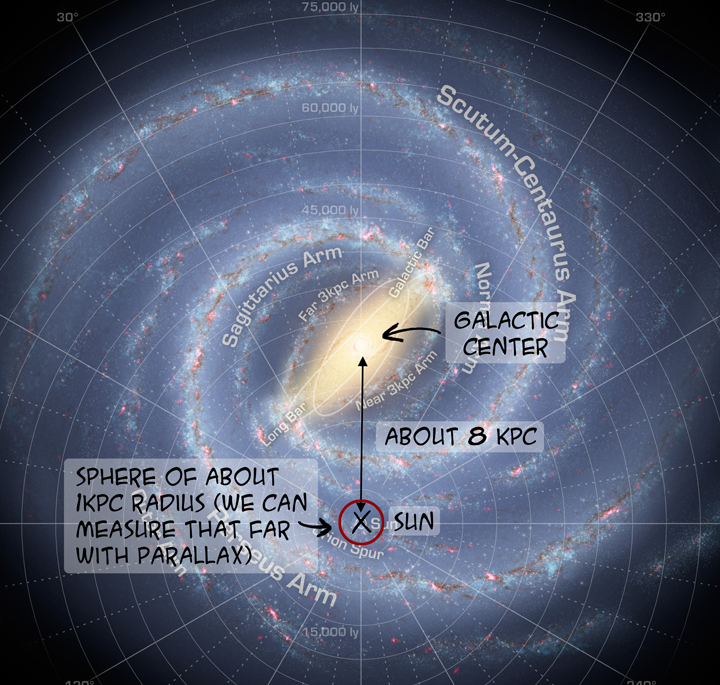 With such accuracy, we can only explore the local neighborhood of our galaxy. “You’ve never heard of the Millennium Falcon?…It’s the ship that made the Kessel Run in less than twelve parsecs.” Source. Beware! Han’s words may suggest that the parsec is a unit of time. It is not! Get more information about this important topic here. This entry was posted in Uncategorized and tagged lightyear, parallax, parsec, small angle. Bookmark the permalink. Like the QRP in Facebook!